Mrs. B is six months pregnant which means she's been on a comfort food tear lately, especially with pasta. She whipped up this Thanksgiving themed Ravioli dish with turkey and cranberry after seeing Giada De Laurentiis make something similar on the Food Network last year. Our original goal was to find ways to use leftover turkey from Thanksgiving in something other than another turkey sandwich. As with most recipes, we like to keep the core idea in place but modify to pair with a specific wine we have open. Speaking of wine, there's two key pairing elements to look at with this dish. First is the palate weight—the tasty little ravioli's with gravy aren't too heavy. On a scale of 1 to 10 (10 being the heaviest) I'd say this dish is around a 5. It's got plenty of flavor, but it's not too heavy. So we want a wine that's a 5 so it has a similar weight on your palate. The other thing to look at is the cranberry note. The turkey and gravy are savory, but for wine pairing, I'm looking for a wine that will compliment or contrast with the cranberry without being too tannic. A new Pinot Noir producer from Russian River called Thralls Family Winery makes a few single vineyard Pinot Noirs that really work well with the dish. Thralls style is to impart a soft kiss of oak integration rather than overwhelm the delicate Pinot Noir fruit with too much oak—that keeps the tannin lower which is preferred with leaner proteins like turkey (Tannin levels should match fat levels). 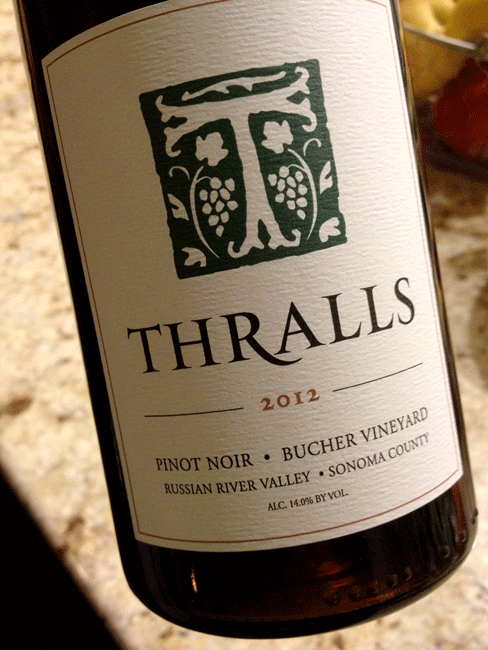 The Thralls Bucher Vineyard Pinot Noir is lower in alcohol with a beautiful expression of fruit from that vineyard site. There's pronounced earthiness and vibrant aromatics coming out of the glass that'll marry nicely with the cranberry, while cutting through the gravy with solid acidity. An Italian take on Thanksgiving complete with turkey, cranberry and gravy. Use fresh ground turkey or leftover turkey from Thanksgiving for a new spin on leftovers. 1. Use ground turkey or leftover turkey from Thanksgiving (if using leftover turkey, use a food processor to chop the turkey and leftover gravy to keep it moist). 2) In a medium sized mixing bowl toss together turkey, egg, bread crumbs, cranberry, parsley and parmesan cheese. Season with about a TSP of salt and TSP of pepper. Make a day ahead of time and cover if you want to let the flavors mingle more. 2. Set out a greased baking sheet or two to prevent the ravioli's from sticking. Place a small bowl of water near your workspace. For each ravioli, lay out a flat wonton (on a surface sprinkled with flour) then using a spoon scoop about a TBSP of the turkey mixture into the middle of the wonton. Using your fingertip, dip it in the water then moisten the outer ring of the wonton. Lay a second wonton wrapper on top and use your finger to go around the edge flattening the pasta creating a seal. Place the ravioli on the baking sheet or refrigerate/freeze for later. 3. Make the gravy before cooking pasta so it's ready. When you're ready to cook the pasta, don't worry about the ground turkey being uncooked. It'll cook perfectly in the hot water. Boil the pasta in a pot with water and a generous amount of olive oil and salt (1/2 cup each). That'll prevent the ravioli from sticking together. Boil for 3-5 minutes depending on whether you use leftover turkey or uncooked ground turkey. 4. To make the gravy melt butter in a large skillet over medium heat. Right before it starts to brown add in shallots and cook, stirring occasionally for 5 minutes until they turn golden and make your kitchen smell delicious. 5. Stir in the flour and make sure to stir until clumps are gone. Add in chicken stock and white wine—increase heat to bring to a boil and then reduce heat to medium low to simmer. Simmer until liquid reduces by half. Slowly stir in cream or half & half along with the parsley. Season with salt and pepper to taste and keep on low until ready to serve.